Outdoor Living, Pool & Spa Inc. Looking to build a custom swimming pool and outdoor living area? 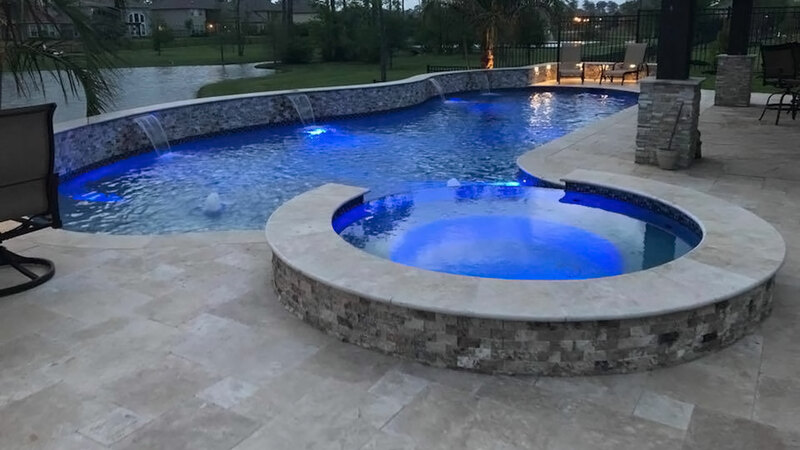 You can count on the professionals at GM Outdoor Living, Pool & Spa Inc. for all your outdoor living additions and renovations. We have been serving Northeast Houston and surrounding areas since 1999. Our team boasts a vast expertise in local building conditions and proven pool construction techniques. Contact our office for a free, in-home design consultation to share your vision for the perfect outdoor living space. Please plan to have a copy of your lot survey at this meeting. We will discuss the specific ideas and options you have to fit your yard, such as custom swimming pools and spas, patio covers, outdoor kitchens & living areas. There are also several features you may wish to add to your design, such as waterfalls, grottos and fire features. We will develop and review a custom outdoor living plan with you and explain pricing and available financing options. Once back at the office, a designer will prepare a detailed 3D rendering of the design. This will include the specific elements agreed upon at the meeting so you can see your vision come to light. All information provided is provided for information purposes only and does not constitute a legal contract between GM Outdoor Living, Pool & Spa Inc. and any person or entity unless otherwise specified. Information is subject to change without prior notice. Although every reasonable effort is made to present current and accurate information, LinkNow!™ Media makes no guarantees of any kind.